The third and final field season is upon us! And I must admit, I am sad and excited all at the same time. I’m a bit sad because it means this is (possibly) the last time I will be able to stay with the people in these villages who we’ve been working with for three years now. The team and I have made friendships with so many people, they know our stories and we know theirs, we have inside jokes and the kids enjoy our company, and everyone is keeping tabs about when Rosi and Mesu will make it back from Dubai and New Zealand. Of course, this isn’t to say that these friendships have to end once the fieldwork is over, Una and Vini have found long-lost relatives in many of the villages, but the opportunity to meet again becomes limited. However, we will return next year, January 2020, to deliver the final research results to the village communities, as well as to other stakeholders. We won’t stay in each village for more than a day though, so this really is the last hurrah. Before I go on, find out more about our newest team member, Vini, on the People Page! I am excited though too! I am excited to be able to process the data and identify some key research findings that will be helpful, interesting, and exciting for the villages to see and put to use in their daily lives. There is a lot of data to process, and I will need to focus on entering and analyzing data that will have the greatest, most direct benefit to the people we work with, before focusing on some of the larger scale applications of the work. I designed the project to cater for both, very important, needs. As as I said above, this is only possibly the end of the project, down the line if funding becomes available, I can continue this project and keep working in Fiji in these villages. Why are we back in the field? But lets get to the reason we are going back out for a third time, which is actually two-fold. So first, we need to do the dietary recalls surveys again (this is the third time now). This will capture what diets look like during cyclone season when there has been no cyclone since Fiji has been lucky not to receive any major cyclones in the past three three years. The second reason is to record biodiversity of the agroforests and look at how individual trees that were damaged in Cyclone Winston have recovered three years post-cyclone as well. This information will be used to help us understand the connection between agroforests and dietary nutrition in Fiji, the dynamics of agroforest recovery post-cyclone, the health status of diets in these villages, and how diets change when cyclones damage agroforest resources. We set sail, which I say almost literally, for our first villages in Taveuni last month. We decided to go by boat this time because out team was bigger (3 people) and we had more luggage and supplies to carry. 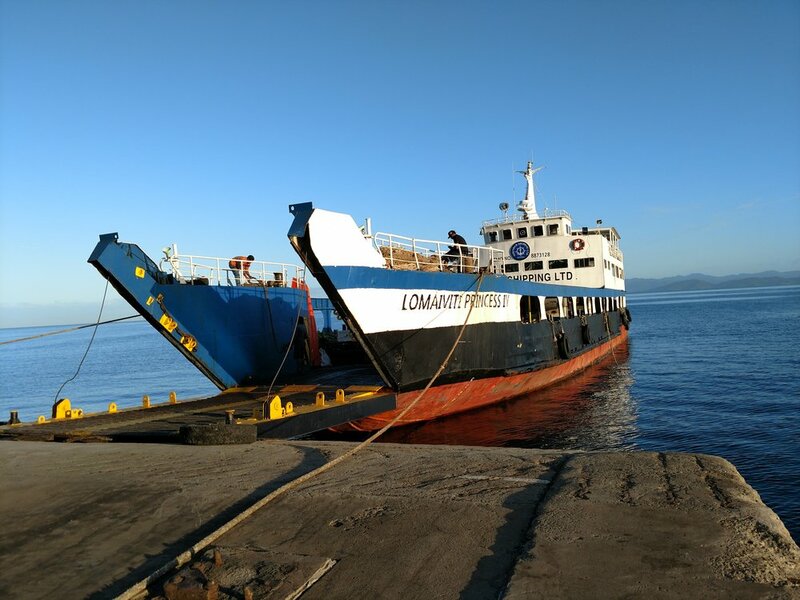 We board the boat in Suva at around 4pm and wait while the cargo and other passengers are loaded, then the boat makes a quick stop in Savusavu, Vanua Levu to drop off other passengers, and then finally make our way to Taveuni arriving around noon the next day. The total sail time is about 8 hours. Then, when we arrived in Taveuni, our driver, Jone, picked us up at the jetty and of we went to our village sites! We spent about a week and half in total collecting the data. It went surprisingly faster this time around, although that is probably due to their being less to set up and more to just simply record. And That Concludes Field Season Two! I am realizing now, Una and I never took a “we did it!” photo. Oh well, we shall make the effort next year. But yes, we have come to the end of a very successful field season, if I do say so myself. To recap, that means 45 eventful days in the field and the use of (at least) nine trucks, five taxis, three buses, two planes, and one ferry (and no I couldn’t think of any mode of transportation we used only 8-6, or 4 times). And too much fish, dalo, cassava, and coconuts It also means a few sick days and many laughs catching up with friends on our breaks in Suva. But before we came to the finish line, we did have the whole of Viti Levu to survey before we could finish, so that is what I’ll talk about here. I suppose it’s not the whole of Viti Levu, but the villages we work in at least, which is still half of the field sites. 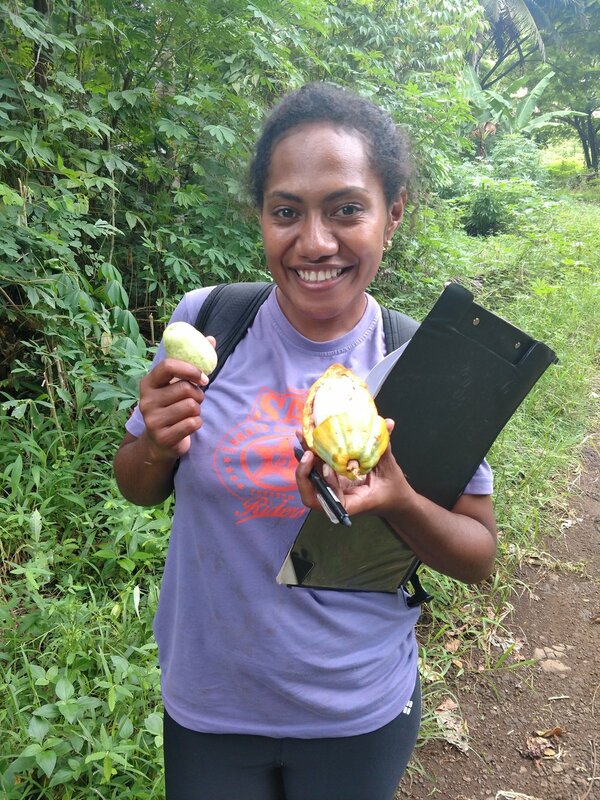 So on August 30th, after about ten days break in Suva, we headed up to the North side of Viti Levu, Nakorotubu Ra specifically, to visit three villages we work in and collect the nutrition data I talked about in the last post. Again, we had a great time in Ra. Lots of great fish and company, and the data collection went very smoothly. We probably all played a little too much ukulele, but is there really such a thing? After we finished in Ra we took the bus back to Suva and prepared for our last two village sites in Rewa. We originally intended to also stay in the villages in Rewa while we did our data collection, unfortunately however one of the villages lost their water supply as so we had to commute to and from Suva to the village for that village. The last village we went to had their water supply intact and we were able to stay in the village while we worked. The villages closer to Suva, the country’s capital city, are very different from the other villages we visit. While all places are unique, the villages in Suva stand out especially because of their proximity to the city center. Many people in these villages work in the city, commuting for work daily. This leaves them less time to work on their farms, and more cash incomes to spend on other food stuffs. Consequently, their diet is much different from the other villages’ diets. 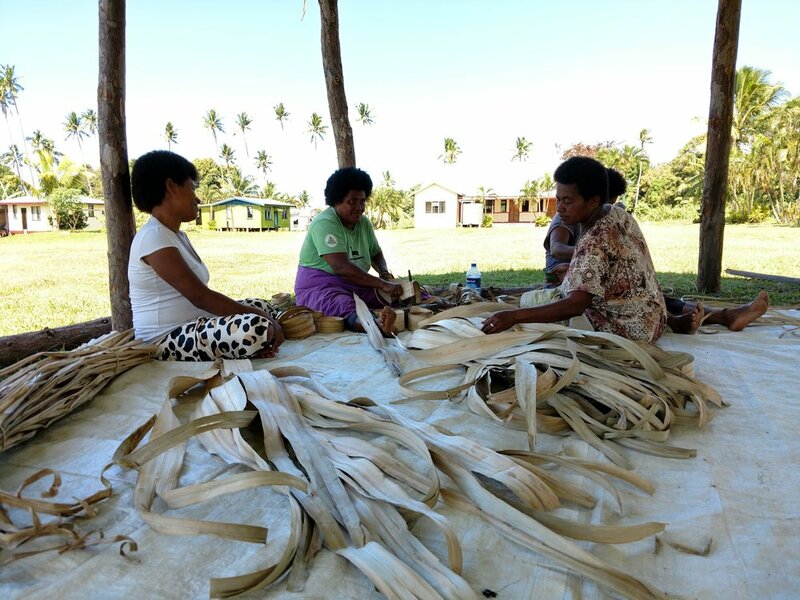 Our work schedule also changes drastically when we work in villages closer to Suva because instead of being able to work with some women during the day, we usually have to wait until the evening when they come home from work to talk with them. It is a pretty big contrast to the rest of our sites but all enjoyable just the same. I am now back in the US and will be working on entering and analyzing my data for presentation to the communities when I return. More on that later! Scroll down for some photos. Honoured to take this photo with the Marama ni Yavusa. More than 100 years old and still strong. A heartfelt send off from Waisa. We had a lovely time together. Children help prepare the fish caught earlier that day. Everyone gets to play the ukulele. Women preparing the voivoi to be sold to the market for mat making. Una saying goodbye to our friends, and research participants. Yes, at the half way mark – a bitter sweet place to be. Una and I have just returned from Taveuni and Vanua Levu where 5 of the villages we work with are located. Two are on Taveuni, and three, Vanua Levu. I usually come back with a bigger belly, a good story or two about mishaps and shenanigans, and calloused fingers from too much ukulele playing. Oh and a ton of data to be entered as well! There was work to be done of course. What Una and I are doing on this trip are collecting data on what people are eating. We work with a group of women who have been a part of this research since 2014, when the research first began. Specifically, I work with the food preparers, who are most often married to the farmers who’s agroforests we visit, to ask about foods they have eaten in the last 24 hours, and foods that have been consumed by anyone in the household over the last 3 months. The idea is that we will use this food consumption data and the agroforest biodiversity data to look at; 1) How much of the food people are eating comes from the farms as opposed to purchased foods or other sources; 2) Given that a more diverse diet (nutritionally diverse) should support healthier people, and more diverse agroforests (functionally diverse) should also support healthier ecosystems, do these two things coexist and if so to what degree? ; 3) How does diet change with different seasons. This was the second round of dietary data collection, the first being in the cyclone season of 2017 (January to March). So, to collect this information, we hand pick specially designed vessels, utensils and volume grids, all imported from oversees, to accurately determine the portion sizes of meals. Or, in other words, we went to the local household goods store and purchased commonly used cups, bowls, and spoons that participants could reference when asking how much of a food they ate or cooked with, and the chart was used to ask participants to describe the volume of certain foods that could not be measured otherwise. Una (Right) is conducting a dietary interview with a participant. The measurement tools are pictured in the foreground. Una (foreground) conducting a dietary interview. Children often get excited about (trying) to answer the questions for their moms. Measurement tools used. Including a 1 liter jug, measuring cups, tea cups of typical size in Fiji, tablespoons and teaspoons, a sizing chart for larger foods. Each interview takes three days to complete, however, the second day no questions are asked, and for a subgroup of the women, the interview is only conducted on one day. The women who we interview twice in three days are linked (marriage, caretaking, mother, etc.) to the farmers and therefore undergo the full interview process, which means they are interviewed about the foods they ate in the last 24 hours two times to capture the full diversity and quantity of foods consumed over time. This part of the fieldwork tends to move along more quickly than the agroforest surveys since women tend to travel less than the men and there are is no trekking up the mountains to the farms, which takes about one day each. However, there is no typical day in the life for our team, except to say that it will be filled with good laughs and food. But sometimes women have to go fishing that day, or attend a school function and so Una and I wait until the women have time to sit down and devote an hour or more of their day to us, and for that we are incredibly grateful. To get to the villages, we employ every mode of transportation: we go by foot, truck, bus, boat, and airplane. Last year we went by ferry boat from the main island, Viti Levu, to Taveuni; however this is a lengthy and exhausting overnight trip so since there was just the two of us this year, we opted to go by airplane. After the plane ride, we hire a truck to take us and our belongings to each village. Once we had finished in Taveuni, we hopped on a small ferry over to Vanua Levu and took a 3 hour bus ride from the jetty to the main town, Savusavu. The rest of the transportation just includes more trucks, airplanes, and hikes up the mountain to find cellular service and internet signal. 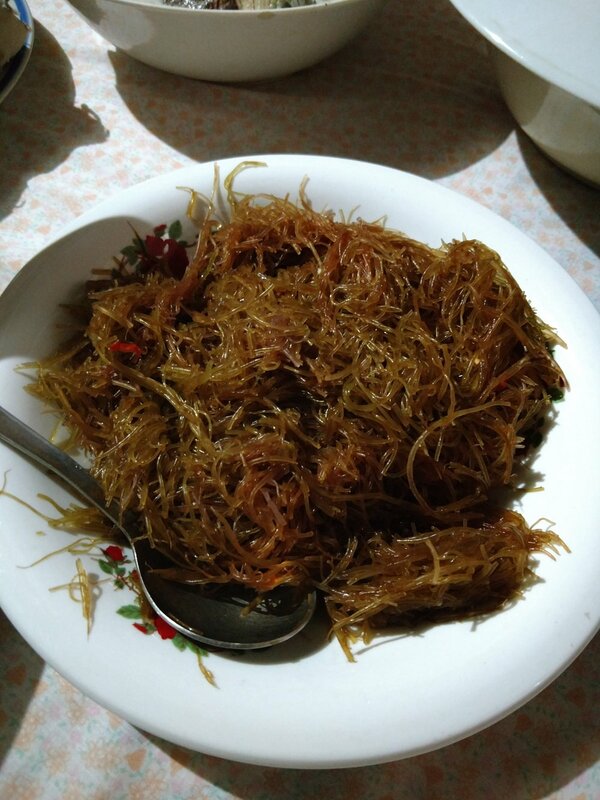 Since this is a part of the research, I thought it would be fully appropriate to dedicate some time to the kinds of food eaten, which also happen to be the meals we have been eating. Boiled vudi. Vudi is similar to a plantain, but grows long and fat and can be used ripe or unripe. As you can see, some of these foods and meals are more nutritious than others, and the reasons this is so are multifaceted and complex, a major point of my research, and so it is difficult to describe here. However, as in any place or culture, food availability, quality, quantity, origin, etc., is determined by cultural norms, environmental conditions, economic status, and so much more. Often times the food we were served was what the people who were serving us considered as the best food or the food we might most enjoy. Keeping in mind that while I might love bananas, everybody ‘knows’ that papayas are the most coveted fruit and so papaya is what we got. It is all about perception… I love both bananas and papayas though, so I don’t complain. This week we are off to the northern side of Viti Levu to visit Nakorotubu, Ra. We have another three villages to work with up there until we finally end back in Rewa, Suva to see our last two villages. Looking forward to checking in again then when we return! We made it! It only took a month longer than I expected to have my Research Visa approval done, but it got done. All in due time I've learned, things happen as they will. I can't thank enough my friends in Suva for helping to push my permit through, especially Taina and Una. I think I would still be in the US if it weren't for them. No matter what, I had to go to Fiji for a wedding, with or without my research visa approval letter (I could still have entered Fiji on a Visitor Visa), and I left North Carolina without the letter. Then I landed in LAX, turned on my phone, and a few hours earlier Taina had emailed me with my Research Visa approval letter from Immigration! This meant I could enter Fiji and have it be on my Research Visa as opposed to a Visitor Visa. If I had only received a Visitor Visa, I would have had to leave and re-enter Fiji to activate my Research Visa. So thanks again to all! Zoom in, you will see the Herbarium listed on the sign. Just take the stairs up to the second floor! So now that I am back in Fiji and being hosted again by the Herbarium Crew, I am getting the ball rolling on my field schedule. In Fiji, in addition to getting support from the various Ministries relevant to your work, and using that support to get approval from Immigration for a Research Visa, you must also get permission from the Roko Tui of each Province in which you wish to work before contacting the Turaga ni Koro of each village. The Roko Tui oversees the welfare of the Province they represent while the Turaga ni Koro is responsible for the Village they live in. So now, my next step is contacting the Roko Tui for each of the 4 provinces I work in to describe my research and ask for their permission to enter each place. After that is given I can contact the Turaga ni Koro to organize the actual village stay and the data we would like to collect. It is an arduous process, but it is all for good reason. With this system, the safety and security of the people, knowledge, land, and others (vanua) are better ensured. It also helps researchers share their work and understand the needs of the communities they work with, as opposed to imposing on them what they think is needed. 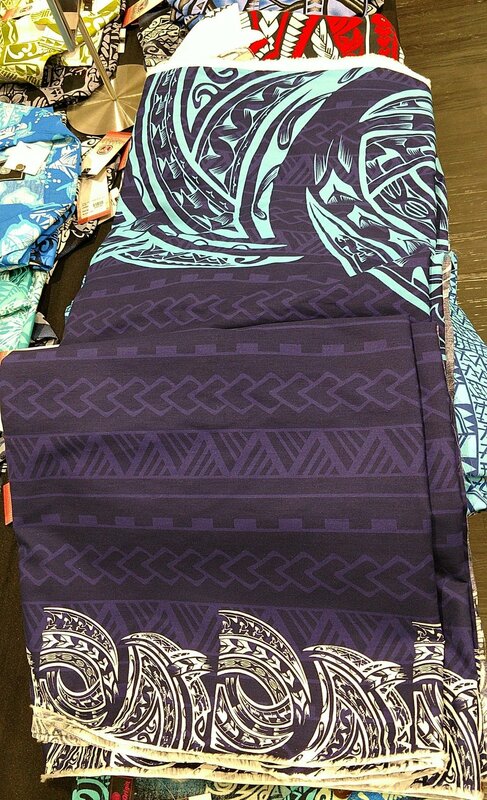 Our Kalavata fabric for bula shirt and jaba. hard to image the outfit it will make but I will post pictures of the finished project. Una and I went to go get our kalavata done this weekend and made them slightly larger than our current size to account for the inevitable weight we will gain in the next two months. No what is kalavata you ask? And why will we gain weight? Kalavata can refer to matching outfits, sometimes between couples and other times for teams and workplaces. In the case of Una and I, it serves as a sort of uniform. The reason we chose to have it made a bit bigger than normal is that Fijian food is delicious! AND we will be served lots of it in the village! So better to prepare for a bigger belly than try to avoid the inevitable. 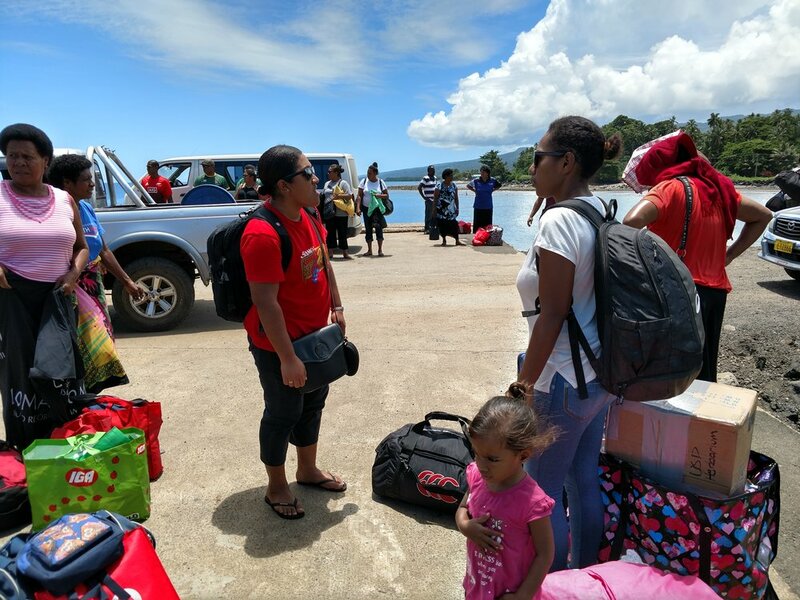 Now we are hoping to leave Suva in the next few days and travel first to Taveuni (either by boat or plane) to where two of our village sites are. The villages in Taveuni that we work in are beautiful. Both are near the coast, however one village sits just on the beach and every morning you can see the ocean hit the shores. The second village is a short drive inland but is also right next to a waterfall with cool refreshing water. It is nice to start the work up here. Then after about two weeks we plan to leave Taveuni and take a ferry across to Vanua Levu and travel down to Bua Province where our second set of field sites are. In Bua we visit three villages. Last year, during the cyclone season, I remember the heat being almost unbearable - I even started to experience a bit of heat rash. This year we will be going during the cold season, so I am very much loking froward to cuddling up in blankets instead of melting away in sweltering heat (however, note that during the cold season the temperature still only hangs around 70F). After this, we will head back to Suva for a short break to recuperate from all the running around, kava, and delicious food. Then after that we will head back out for another week or two to Ra on Viti Levu to visit three more of our village sites. These places were the hardest hit by cyclone Winston than all the other villages we visit for our research. The trees were badly damaged up here and on our last trip up there, about a year post cyclone, the mangroves, which are trees that live in march like environments and protect the coast from large waves and erosion, were still dead-looking from the cyclone damage. This is also the place were I got dengue... So I will be fully armed with bugspray this time, unfortunately. And last, we will travel back down to Suva once more to visit our last two vilages which are just on the outskirts of Suva. These villages were hardly impacted at all by the cyclone and differ drastically from the other sites because of their close proximity to the capitol city. Our main aim for this round of data collection is to look at diets during the cold season to use in the nutritional component of the study. I will talk more about that in the next post! Packing up and moving house is always a chore, it’s also always a bit sad – but it’s a different kind of sadness that’s not easy to explain, perhaps more a reflection on the past year and the people I’ve met. But it’s the best excuse to do some cleaning and re-purposing of things I don’t need. So really, I actually appreciate it. So I’ll be headed off first to a friend’s wedding and then finally to Fiji to (hopefully) get back to my fieldwork. I say hopefully since I am still waiting for my visa to be reapproved. BUT I need to throw a big shout out though to Sarah Pene and Siteri Tikoca who so graciously agreed to help me lodge my permit with the Immigration Department. Actually this research wouldn’t be possible without a whole slew of people supporting me every day and backing up my research. This won’t be the post where I list everyone though, but I will post at some point. What can I present back data-wise to the people I have been working with that will be interesting and useful for them? Have I fulfilled all my legal obligations and sent in all the reports to the Ministries that support my work? Have I said goodbye and thank you to my friends and family here!? So this week will consist of packing and giving away my stuff, next two weeks will be family and friends time, and then off to Fiji for more work AND catching up with friends and family there. Last, as a very quick aside, some of you may have noticed the eruptions happening on Big Island (Hawaiʻi Island). If you can please take a look at ways you can help the Hawaiʻi residents and community. My friend and labmate who lives on Big Island recommends the Food Basket for East Hawaiʻi. And now we add olives! Okay, so they aren’t really olives, but they are in the Olive family, Oleacea. I’m referring to olopua, also known as Nestegis sandwicensis. This tree is a long-lived endemic species to Hawaii, sadly inedible, found in dry to mesic forests. So what does all that mean? This is the second tree species we are adding to our experimental plots to study predation and germination, along with the lama. Strangely though, we can’t find any ripe fruit! It seems as though they are all being eaten by predators in the trees themselves before they become ripe and fall to the ground. Similar to an olive, you will know when the fruit is ripe when it turns purple/black. All the ones we find are still hard and green. (See picture above for image of the fruit, the darker one has begun to decompose, but its not ripe). Our experiment requires that we use ripe whole fruit and ripe fruit that has had the pulp taken off. However, for weeks we have been waiting for ripe fruit to drop and it still hasn’t, so we decided to go ahead with the trial with the unripe fruits, but only setting up 50% of the plots. Always make sure you are on the same page with everyone on the team! Otherwise you may have to re-set or re-do experiments. I accidentally covered the fruits with leaves in their plots when we set them out two weeks ago, which we weren’t supposed to do. We re-set them this weekend. Pictured here is the corrected plot setup. This week we were lucky to have a few extra people joining us to remonitor and reset plots. This included my advisor, Dr. Ticktin, and her daughter. As well as my labmate, Georgia, and her husband, Gil. In addition to setting out the plots, we also did a little more exploring. Here is a little collage of people and plants I took over the past two weeks. An opolua fruit has been opened in half and the inside seed eaten. Example of predation. There are lots of these little ones growing around here right now. Auricularia sp. Yes, you can eat them. They must be cooked and you want to make sure they haven't crossed the paths of any snails, which can carry rat-lung-worm disease. Yum! 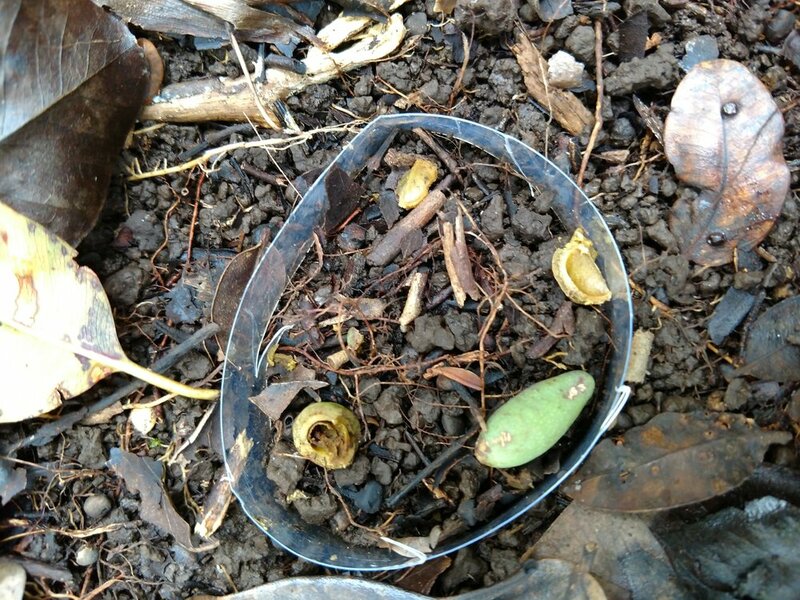 We found some lilikoi fruit on the forest floor. We all had some fun in the forest. So here’s an update to the Hawaii research project I have been participating in. We have been going back to the site to re-monitor the plots, checking to see if the fruit or seeds have been eaten by other animals, or if they have actually germinated and are starting their next life cycle, or if they have succumbed to some other fate. This trip we were also accompanied by Tressa Hoppe, an undergraduate research assistant working in our lab. Tressa has been helping to set-up and monitor these plots, as well as set up some germination experiments to assess germination in a controlled environment – meaning in an environment where we can keep as many factors as controlled as possible (i.e. amount of water, sunlight, soil type). Zoe Hastings giving us our field instructions. Tressa Hoppe preparing her notebook for data collection. The day started out by splitting into two teams. Zoe Hastings, who is leading the project with my advisor, Dr. Ticktin, went off by herself to monitor the plots, and Tressa and I set out together. We found some interesting results! Many of the seeds, and even some of the fruit, had started to germinate. First off, germination just means that the seed, which is dormant, has started to develop a root and will soon be developing its first leaves – the arms and legs if you will. We didn’t see much germination occurring, but where we did see it, it was mostly in plots where the seed had been separated from the pulp of the whole fruit. We were excited to see a few instances though where this was not true, and some seeds still inside dried up old fruits, had also begun to germinate. One unfortunate fate of the seeds, although interesting to us, is that some of them have succumbed to a mysterious blue mold, or we assume it is a mold. A very pretty color indeed, however, not such a great ending to the seeds we are trying to monitor as this renders them unviable (i.e. unable to germinate and grow up into a tree). We don’t know what it is yet, but we are going to send them over to some folks in the Plant and Environment Protection Sciences who graciously have helped us identify these types of things in the past. In order to try and see what kinds of critters may be eating our seeds, and since we can’t keep an eye on our plots all the time, we installed cameras at a few select places in the area that will take pictures every time there is a disturbance in the field of view. We haven’t analyzed these photos yet, but it will be exciting to see what we capture. 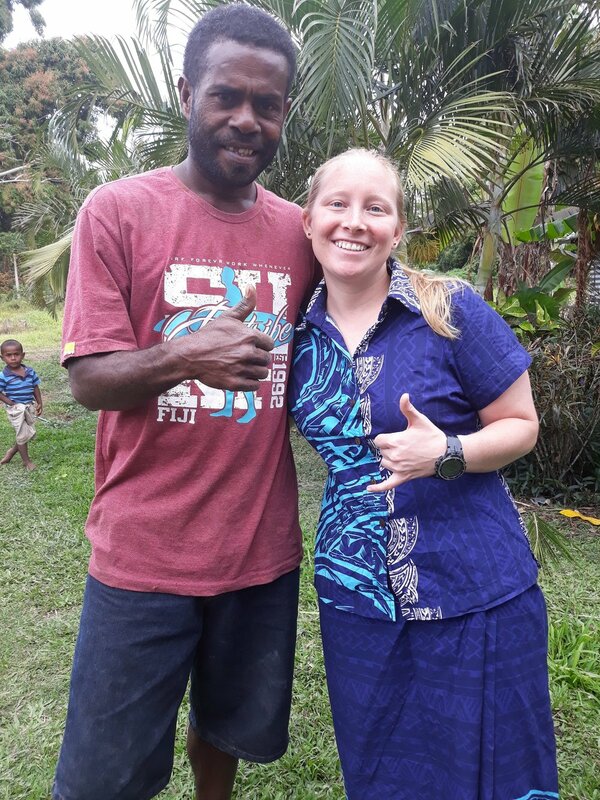 As promised, I am here to tell you a bit more about Vanuatu, and the amazing people I get to work with, and what I do there. To get started, I want to give you a brief history about the country and where it is in the world. Vanuatu is a country of about 280,000 people and home to around 80 islands just to the West of Fiji in the South Pacific. One might be surprised to know that Vanuatu has the highest concentration of languages per capita in the world. For those of you who were thinking I am mistaking this with Papua New Guinea, Papua New Guinea is actually the most diverse, but given its geographic size, it can’t claim the title of most linguistically dense. What this means though in Vanuatu is that in every village you go to, they will most likely have a distinct local language that is not used in a village only a few miles away. In addition, due to Vanuatu’s history as being jointly governed by the French and the British, many people also speak either French or English with some people speaking both. Beyond this even, Vanuatu has developed a local language that almost everyone speaks and is a combination of English, French and various local languages. This language is called Bislama and is fairly easy for an English speaking individual begin to understand, as the words are largely of English origin. In turn, the people of Vanuatu, Ni-Vanuatu, are often bi-, tri-, or quadrilingual, and sometimes speak more than this! Much of what we know botanically about Vanuatu comes from the Northern most islands, however, the work I am a part of is focused in the Southern islands. Some of the communities we work in also speak French, and I don’t speak a lick of French. Thankfully, many of our team members do speak French or Bislama and there are a number of people in the communities that we work with who also speak English. Just a few team members from our recent trip. The project is large and diverse, which is also an accurate description of our team. Composed of folks from Vanuatu’s Department of Forests and Cultural Center, the New York Botanical Garden, California State University, Swarthmore College, the South Pacific Regional Herbarium based in Fiji, and the University of Hawaii, together we are a team of students, professors, researchers, and professionals specializing (ethno)botany, mycology, linguistics, and ecology. Parts of the project focus on language documentation, especially of plants and other tools, and then also information about what plants are important for medicine, construction, ceremony, crafts, and other uses. The mycologists on the team focus both on macrofungi, or what we think of typically as ‘mushrooms’, and microfungi, which are microscopic fungi that can live in places like our soils or on plants. Others of us look at native forest biodiversity and recovery after major cyclone disturbance, cyclone Pam of 2015 being our example of disturbance. I work both on the documentation of plants important for health, specifically women’s reproductive health, and on how the forests are recovering after cyclone Pam. This December trip was focused on the native forest recovery part of the project and as such, I’ll talk about this work in this post, saving a description of my other work for another time. So how do native forests recover after a major disturbance like a cyclone? Well, we don’t fully know. We can make educated guesses and hypothesize how they will recover based off of studies done in other parts of the world, such as in the Southeastern US, the Caribbean, and South America for example. However, these studies are less applicable to the South Pacific as these countries’ infrastructure systems are dramatically different, the types of plants and environmental conditions are not always comparable, and most especially, the cyclones themselves have been historically different in intensity and frequency. Furthermore, there are only a handful of studies in the South Pacific that have looked at how cyclones impact forests and their recovery, and even these have only looked at indirect cyclone impact. Our research represents the first study to my knowledge to assess what happens to forests after the direct impact of a large (category-5) cyclone. Now, we have to have ‘before’ data in order to compare what happens ‘after’ the cyclone hits, right? We have to know how many trees there were, how tall and round they were, how much did their branches shade out the ground below, etc., in order to know how much changed based on measuring these things after the cyclone. One reason why these studies are few and far between – we just don’t know more than a few days ahead of time when and where a major cyclone is going to hit. And I sure am not going to run out in front of a storm to try and collect this data, even if there is a few days warning. Amazingly, this was data that was collected just prior to the cyclone, the last of which literally was collected just a day before Pam hit! This is also a good example of the dynamic (and sometimes dangerous) nature of fieldwork. 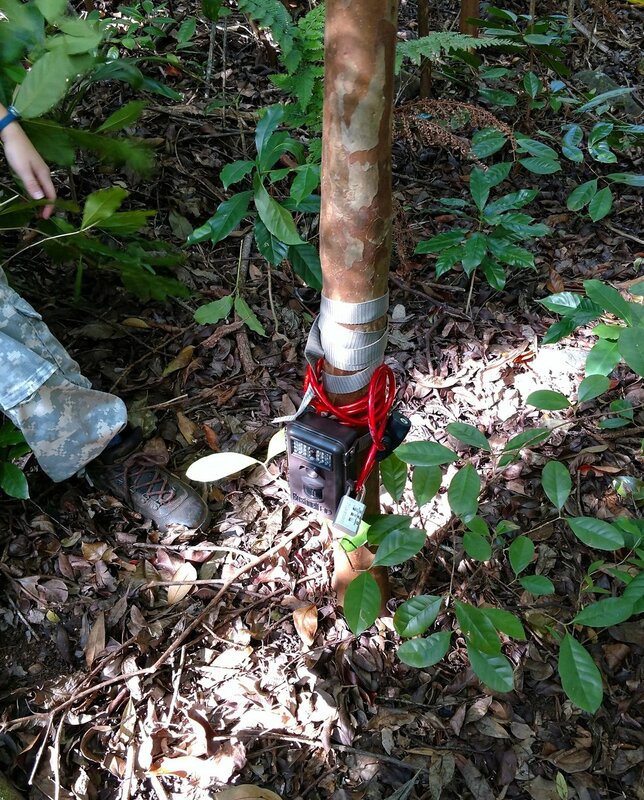 Originally, the project aimed to document the biodiversity of the native forests in the Northern island of Tanna, but when the cyclone came, it presented a new opportunity to also assess how cyclones change biodiversity and the kinds of damage cyclones can inflict on various types of trees using these established sampling units called, transects. 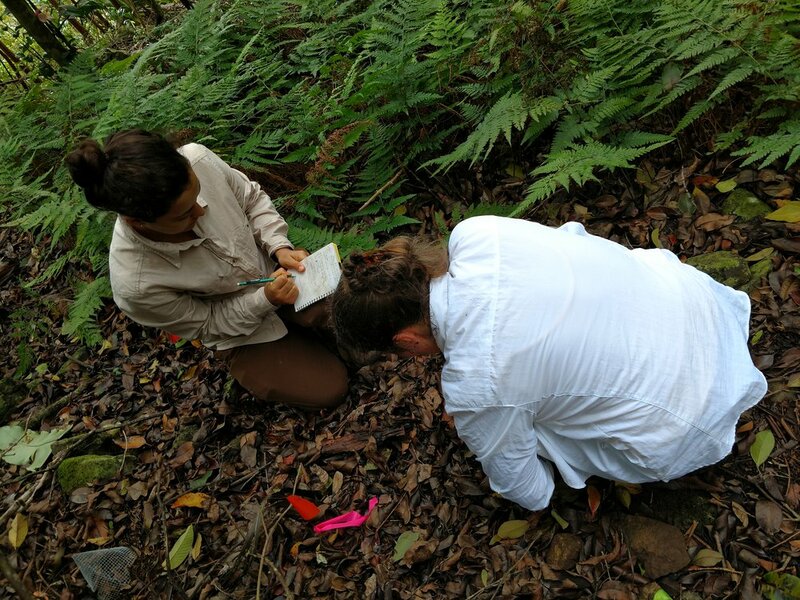 Before I became involved on the project, the team had set up 8 transects, with 8 10m x 10m plots to a transect, across Tanna in three different communities to record the biodiversity and size characteristics of the trees and other plants. They recorded how much of the sky was covered by foliage and shading out the ground below (canopy cover), as well as how much of the ground was covered by smaller plants (ground cover). When I entered the project, we decided to set up two additional 1m x 1m seedling and canopy cover photo subplots within each plot of the transect, placed randomly in the corners of these plots, to record how ground and canopy cover, and seedling diversity changed (see diagram above). Seedling: when seeds and begin to grow, they are called seedlings as they emerge from the ground. Nancy and I taking a canopy cover photo in 2017. In 2015 her older sister, Nellie, helped me in the field. With the help of people from the local communities and some of my other team members, we set up these subplots in each of the transects in November of 2015.In each subplot I recorded the species (or type) of seedling growing and how tall it was, and assigned it a number which I wrote on an aluminum tag and attached to each seedling using a metal twist-tie placed like a loose belt around the seedling’s stem. Often times many seedlings will sprout at once, however, they can be fragile and, competing for limited resources, many don’t survive. Because of the sheer density of seedling growth after the cyclone, we focused only on seedlings of woody plants, primarily trees. I also took photos of the canopy at this time using a hemispherical fish-eye lens. This bubble-like lens shape attached to the camera allows me to get a 180 degree view of the canopy above and assess how much light is allowed down to the ground for seedlings to use to grow. 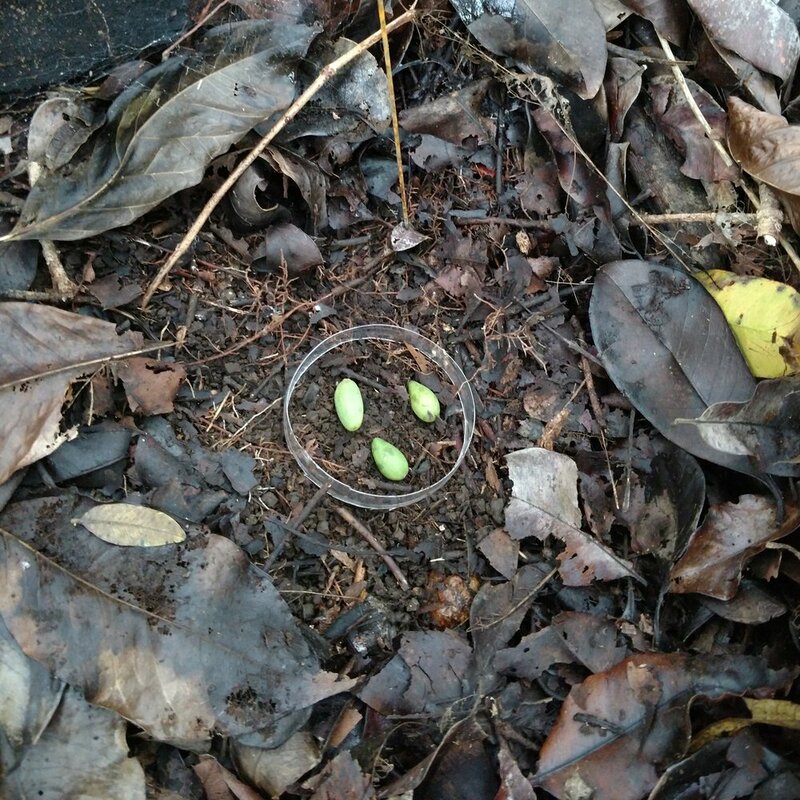 There were a lot of seedlings to tag in 2015! This was thanks to the increased light allowed in from the damage the cyclone had done to the canopy. However, by the time we returned this December 2017, the canopy had closed up considerably as new branches had formed and new leaf growth covered in the gaps formerly seen in the canopy from the wind damage. As you might expect, there was also a dramatic decrease in seedling density this past trip. Many seedlings had died, however, a few had made it and were now growing taller – on their way to becoming saplings, the next larger size class in tree development. I also took photos of the canopy again, noting how much less sun I could see coming in to the photos. Canopy cover photo from 2015. Much of the canopy, which consists of tree branches and leaves, is open, allowing sunlight to shine down to the ground below and help seedlings grow. As we begin the new year and the next semester, we will enter this data and an undergraduate student researcher will begin to analyze the differences in canopy cover between the two years. I will also begin preparing for my comprehensive exams, which involves loads of reading and eventually writing, to hopefully become ABD, or all but dissertation. More on that in the next post! 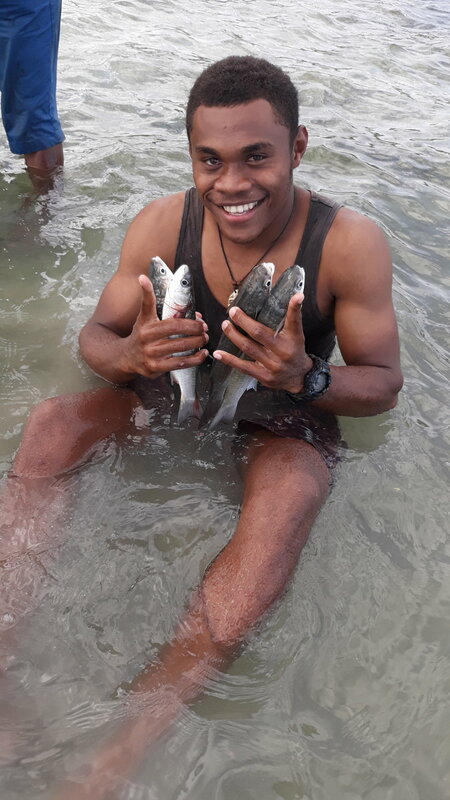 The places I usually get to work are in Fiji and Vanuatu, but our lab, the Ticktin Ethnoecology and Conservation Lab, carries out many different kinds of research projects both individually and as part of Dr. Ticktin’s on-going collaborations right here at home. One of the projects my fellow lab mate, Zoe Hastings, is working on with Dr. Ticktin is a dispersal, predation, and germination study of the lama tree (Diospyros sandwicensis) as part of a larger, long-term study looking at the population dynamics of common mesic (moist) forest trees in Hawaii with the Board of Water Supply. 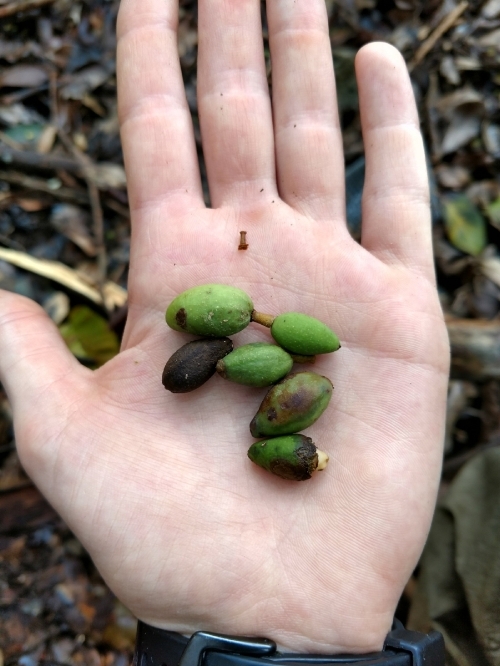 This past month, Zoe and another labmate, Reko Libby, drove across island to the leeward side to collect lama fruit in a protected valley, which aptly look like mini persimmons, their far away cousin, and set up plots to assess what happens to them over time. Some of this fruit was de-pulped, or the flesh taken off to expose only the seeds, while others were left whole. This was done to see if the fruit germinated more readily if it was left whole, or if some removal of the fruit was helpful to it. Next they placed the fruit or seeds either in cages, to keep rodents and birds out, or left them out in the open to record what kinds of insects and other animals interacted with them, if any. These scenarios are called treatments and are monitored over time. The four treatments being: whole fruit in a cage, whole fruit with no cage, de-pulped seed in a cage, and de-pulped seed with no cage. Each of these plots are spaced out at a set distance from each other and randomly assigned a treatment. The following week began the fun part, observing what happens! Which I happily got to help with. The last two weekends of November I came along with the team to help remonitor the plots and record what kinds of activity had gone on since they set up the experiment. The first week, Zoe and I observed some exciting changes to the fruit and seeds. In some cases it looked like small rodents had nibbled at the seeds and fruit in the cage-less plots, and in others, ants and other insects had started to de-pulp the fruit as well. This remonitoring will continue each week to look for additional predation and de-pulping, as well as germination of the seeds. However, I will have to take a break from assisting on this project for the next few weeks as I return to Vanuatu in December and will be continuing to work on a natural forest regeneration study post-cyclone Pam of March 2015. I’m looking forward to updating this blog after I return and sharing all about that project.